“What are you doing up there?” Robert said from his desk. 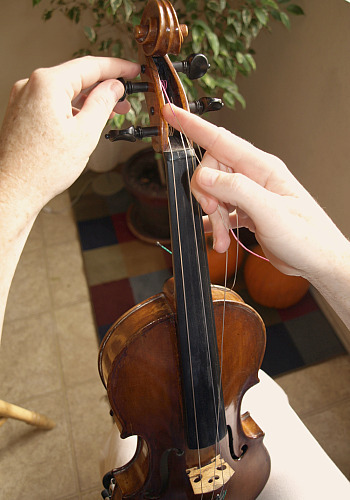 “New string.” I try to attach a new string with some elegance: tuck the end under, wind the string toward the peg box. “What is that, about 16th-century technology?” Robert said, looking up from his MacBook Pro. “Technology?” I said, not looking up. There we go: string tamped down, tightening. Now carefully, I hook my index fingers around the string on either side of the bridge, and with leverage from thumbs, lift the string up a fraction of a millimeter on either side of the bridge to relieve the pressure. Tighten again, repeat. Adjust bridge. In a year or two, that computer will be in a landfill or a recycling center. How old is your fiddle? Anne - that's a great point about the computers going to landfill and who ever wanted to pay $70 to go listen to a computer anyway! Laurie, even just reading about it I find myself flinching when you mention readjusting the bridge. That still scares me to bits every time, I'm happy to put strings on/tune them up etc, but fiddling around with the bridge (even when doing everything the "proper" way as you describe) is so nervewracking. Is that your Signor Gagliano in the photo? Beautiful scroll, what strings do you prefer for him? Wow I must disregard protocol alot! I change strings in almost 2 minutes and I adjust my bridge even quicker! Tightening new strings makes me shudder. Especially when I hear that scrunch and the noise that sounds like old sailing ship's rigging. Yes, it's the Gagliano, but a later scroll...! Scarier not to adjust the bridge, yes? Strings and bridges don't bother me too much, accept for my public school kids' instruments. Some of those instruments were obviously made by crack smoking, half blind, numb fingered teenagers who were texting at the same time they were trying to "craft" an instrument. Where do they get those things? I always try to give them reputable dealers but somebody always has an "uncle Bob" who played violin in fifth grade who gives them their priceless Stradivari (copy). Inevitably my beginners bring their instrument to me with the bridge having fallen over and I have to gingerly try to tune their Christmas tinsel-like E string. Its like trying to hotwire a bomb or something. Of course, if the E string breaks these kids with the gimcrack instruments look at me like I'm a total nube or something. "Hey Mr. Gardner....where'd you get your instrument repair license.....Wal-Mart?" On a side note I'm very proud of myself. About a week ago, one hour before a gig, my soundpost was knocked out of place by my well meaning, though slightly clumsy five year old. There it was rattling around inside my violin. What to do. So, I made myself a soundpost reseter out of a stiff coat hanger and began what I thought would be an ardous task. I GOT IT ON THE FIRST TRY! It was like magic. I probably should have gone out and bought a lottery ticket right there on the spot since it was my lucky day. >Now carefully, I hook my index fingers around the string on either side of the bridge, and with leverage from thumbs, lift the string up a fraction of a millimeter on either side of the bridge to relieve the pressure. Wow, I've never thought to do this, and yet it makes perfect sense. The things one learns here! You said “@#$%^&*?!” ? Gosh, Laurie.